There’s also Kit Walker; the mysterious and handsome man who is renting the most luxurious cabin on the ship, but who nobody ever sees. As the expedition progresses, Jenny finds herself becoming increasingly obsessed with the enigmatic Kit and the secrets he hides. Will she crack the code before the return journey or is she bound for another disappointment?" I have to say I found the beginning of this book a little unbelievable, I mean accepting a job on a cruise ship and not checking the destination, really? So when Jenny turns up with a suitcase packed full of summer clothes, she is in for a little bit of a shock when she discovers that Christmas will actually be spent in the Antarctic. But what follows is a nice romantic tale full of mystery and adventure. 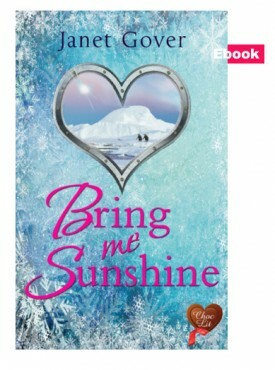 I liked the way Janet Gover used a number of the cruise ship passengers, who each have their own little tale, and reason for being there, to build a nice cast for Bring me Sunshine, and I really liked the moments that Jenny and Kit spent together.